Is it possible that demographics are not as important as marketers have always thought? Could be. Particularly with mobile searchers. Think With Google reports that marketers who try to reach their audience solely on demographics risk missing more than 70% of potential mobile shoppers. People check their smartphones 150 times per day, make decisions quickly and for reasons you might not expect. And Facebook adding emoticons to their “like” button was top news on… terrestrial radio. What? Speaking of radio… should your marketing plans include radio? Nielsen reports that radio is reaching more than 90% of US adults weekly. 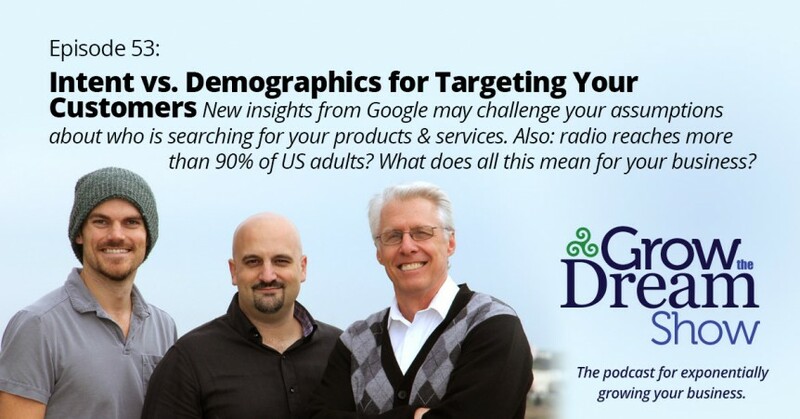 Are demographics failing you? A recent article from Think With Google (and the underlying study on “micro moments”) explode some of our theories about which demographics might be doing what in terms of searching from their mobile devices. Among the findings: we’re spending 177 minutes per day on our phones, an average of 1 minute, 10 seconds at a time. The implications for how mobile users will experience your brand are enormous! Annnnnd it’s our first video podcast episode! Now you can watch! (see below) We’re also testing out live streaming again this Friday. Visit GrowTheDream.com/live to be notified of your opportunity to join us for the live show!